After seven years of operation, the Backspace Gallery, which is part of the S.P.A.C.E. Gallery, is closing up shop. As Seven Days recently reported, the Soda Plant, which houses both galleries, will absorb the space and repurpose Backspace as a production facility for Conant Metal and Light, located in the same building on Pine Street in Burlington's South End Arts District. The creative lighting and metalwork company's owner, Steve Conant, also owns the Soda Plant. 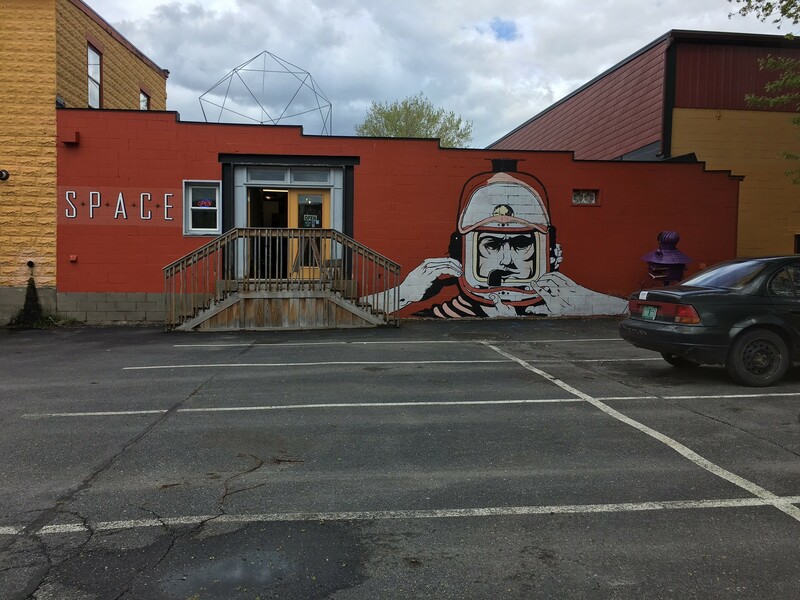 Many of the displaced artists from Backspace will relocate to the S.P.A.C.E. Gallery. Backspace officially closes its doors on Monday, June 5. The galleries' founder and studio manager, Christy Mitchell, has been hosting live events semi-regularly at Backspace since its inception in 2010. "We're losing a huge room," says Mitchell recently by phone. "[It's] been an asset to us, but also to Burlington in general to have a space that is accessible that's not a bar or club. It's an art gallery, so you can do things that are a little bit different." To celebrate its tenure, Mitchell throws one final blowout at the Backspace Gallery on Saturday, June 3. Entitled Seven Year Itch, the event features an eclectic mix of live music, performance art and DJ sets. The lineup includes instrumental hip-hop/funk group Gnomedad, punk rockers Blowtorch, performance artist Throat of the Loon, post-rock trio Entrance to Trains, and DJs Synesthesia, Clothcutter and State Vector Collapse's Leif Hunneman. Check out videos from Throat of the Loon, Entrance to Trains and Gnomedad below. To stimulate your other senses, the olfactory sorcerers from Alice & the Magician will provide "scent landscaping" to accompany an exhibition from mixed-media artist Alex Costantino. Mitchell hopes to find a new space to continue her efforts in the realm of live, performance-based art. "I think my next project will be an event space that has a similar vibe," she says. "I definitely see it in my future — I just don't know where yet." The party starts at 9 p.m. For more information, check out the event page on Facebook.